The Human Resource Information System (HRIS) is a software or online solution for the data entry, data tracking, and data information needs of the Human Resources, payroll, management, and accounting functions within a business. It is useful for all processes that you want to track and from which you hope to gather useful and purposeful data. Normally packaged as a database, hundreds of companies sell some form of HRIS and every HRIS has different capabilities. Pick your HRIS carefully based on the capabilities you need in your company. As HRIS have become increasingly sophisticated, the choice has become enough to practically paralyze an HR department. Watching a technology company, where computer experts exist, go through three different HRIS systems in ten years before finally settling on their current system, was an education in their complexity. This is why choosing an HRIS is a major undertaking for a business. The salespeople are often commissioned salespeople who verbally may tell you that the system will meet your needs. Make sure you check this out with multiple sources including current customers, online discussion groups, LinkedIn, other SHRM members, and Google reviews. These are the other factors to consider as you select your HRIS. Remember that even if your company is only a few people today, it may have twice that many or even 10 times that many employees in the future, so pick a system that can grow with your business. Another key factor that you must consider is that many HRIS are able to accomplish only part of what you need automation to accomplish. In these cases, you will want to make certain that the components of any add-ons or additional systems work together flawlessly. Again, don't take the salesperson's word about the systems working together. Do your research. Check also to see what kinds of training and ongoing support are available for your staff. You should also ensure that the sales consultant's promises about training and follow-up following the purchase are written right into your contract to purchase the HRIS. And, check with other organizations to make certain that your selected company has a track record of ongoing, helpful support. Data such as names, titles, addresses, and salaries are a basic start. Salary and position history, reporting structures, performance appraisal histories, and other critical employee information. This includes such items as employee handbooks, emergency evacuation procedures, and safety guidelines. You will want benefits administration including enrollment, status changes, and personal information updating. In an ideal system, you can allow employees to look up and review their own information, including vacation tracking. This integration will also include other company financial software and accounting systems. When these are connected, you can ensure that paychecks are correct. There is never a disconnect between what the official pay rate is and the information that payroll has. If the systems don't integrate, it's easy to update a salary in one system and not in the other. When your system is seamless, the recruiter can click a hired button and all of the information from the applicant is transferred to the employee side of things. This saves so much time because your data entry and paperwork practically disappear. If an applicant puts in his own information when applying, you can ensure accuracy. If the offer letter is generated out of the same system as the payroll system, the salary will match perfectly and there is no misunderstanding. It's not just enough to have plans if they are recorded in a central system, then they can easily follow the employee from position to position. 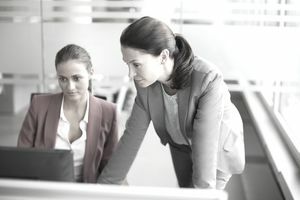 Senior leadership can run reports to see where people are and what their individual bosses are planning in terms of succession planning for their futures. It's important to keep track of who has been suspended, demoted, or had other negative actions taken against them noted—even after the employee leaves your organization. When a company calls and asks for a former employee reference, it's easy for an admin in the HR department to look up and report back whether or not the person is eligible for rehire. This is especially critical in a company where certifications and licenses are required. In other companies, training records may not have that level of importance, but you may still find that having the information is useful as you develop your employees, a key factor that they want from work. applicant tracking, interviewing, and selection. It's fairly inexpensive to implement a basic HRIS, but make sure whatever you implement meets your company's actual needs. Do you want to be able to run turnover reports? Post organizational charts?